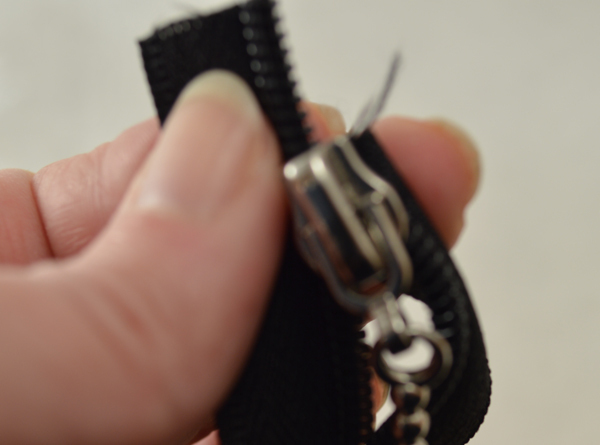 Okay, I’m not actually going to “make” the zipper. 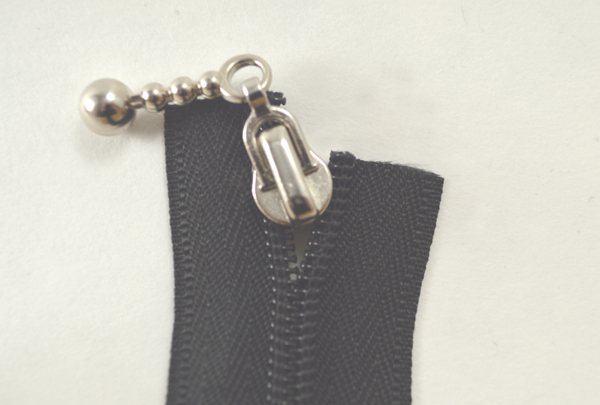 Maybe a better title would be “How to Assemble a Zipper.” To start you need to gather your materials. 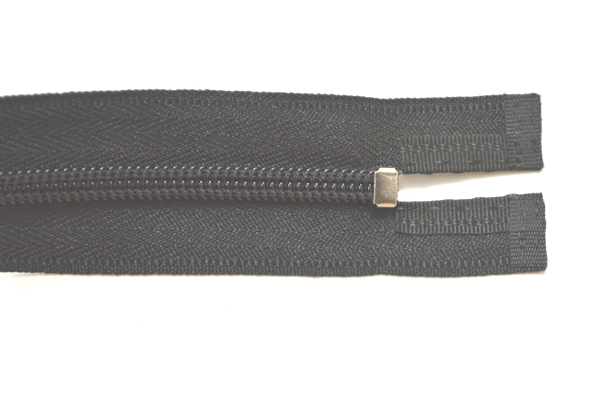 Decide how long you want your zipper to be. 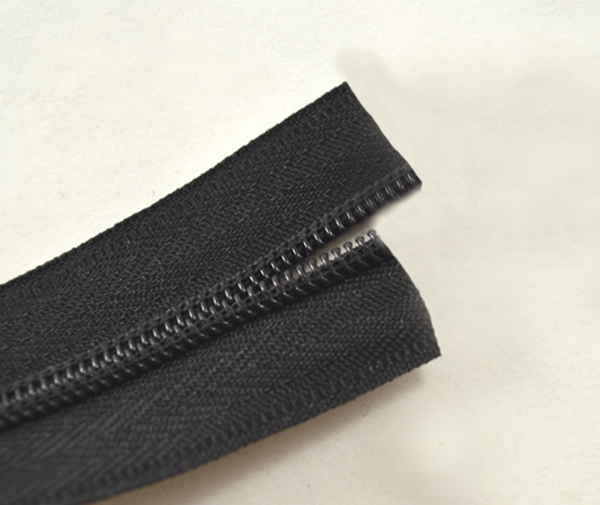 Cut your zipper yardage about 2 inches longer than your desired length. 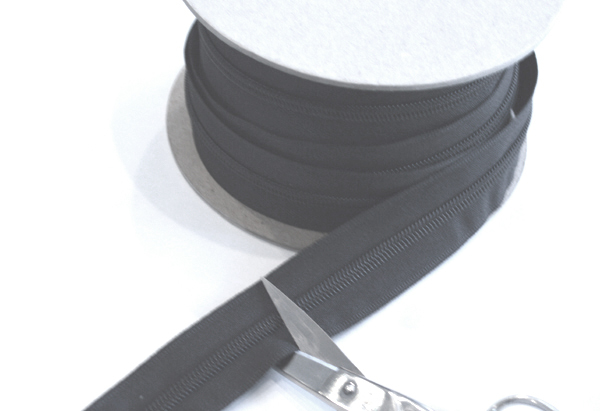 I am going to make a 12” zipper, so I’ve cut 14” of zipper yardage. 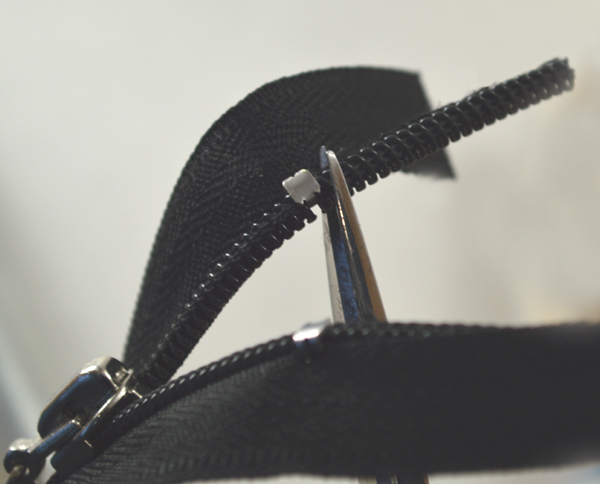 Now pull apart the coil on one end about an inch. 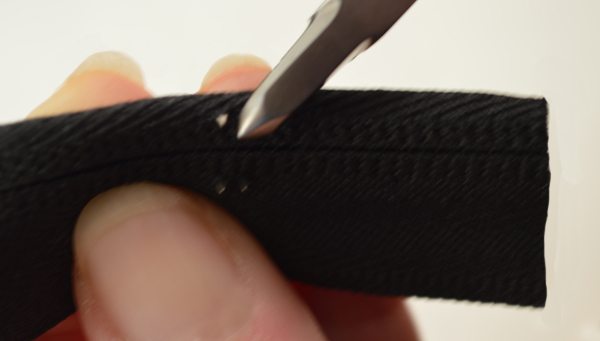 You need to thread the zipper through the rounded edge of the slide. 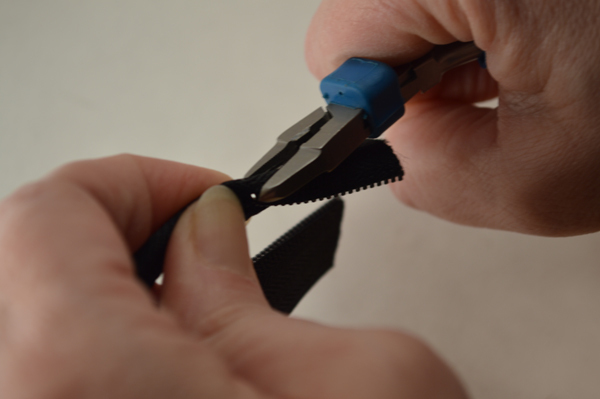 With your left hand grasp the left side of the zipper tape between your thumb and forefinger. 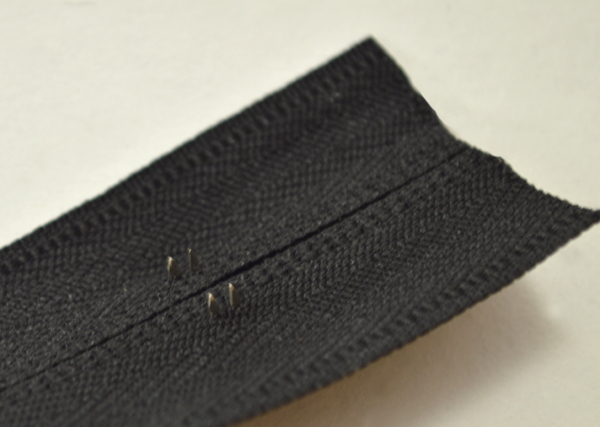 With your right hand thread the left side of the slide onto the left side of the tape. This will go on fairly easily. Now for the tricky part: This takes a bit of practice. The left side of the tape is still between the thumb and forefinger of your left hand. 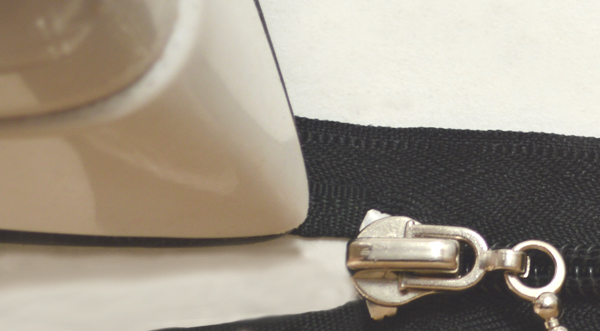 With your right hand, thread the right side of the tape into the right side of the slide. 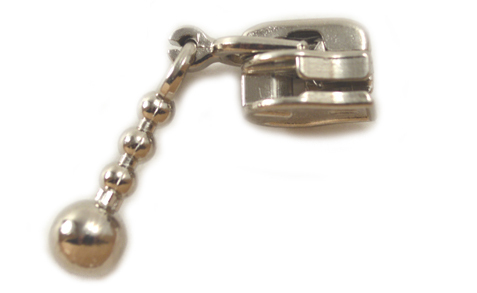 Now, with your right hand jiggle the zipper pull until it engages. Yes, it’s awkward. It’ll take a few tries the first time. 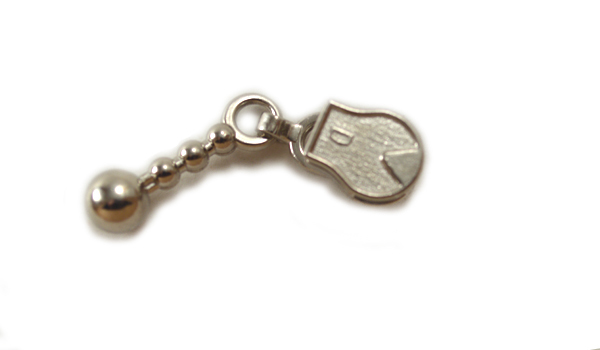 Just when you’re about to give up … it’ll suddenly catch … success! You’re almost there! The hardest part is done. 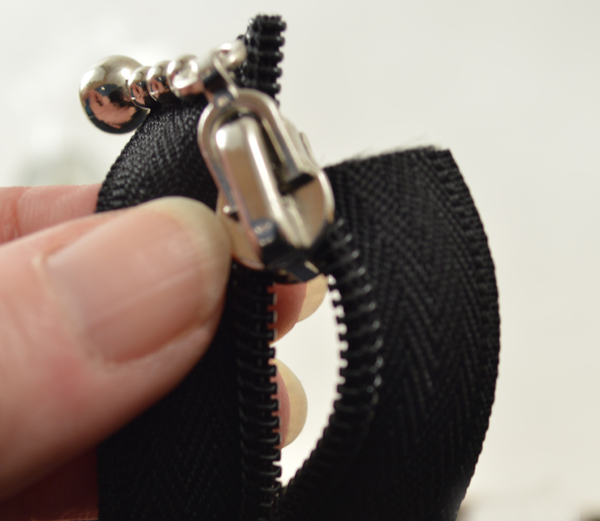 Pull apart the zipper coil at the end. Now we’re going to put on the top stops. 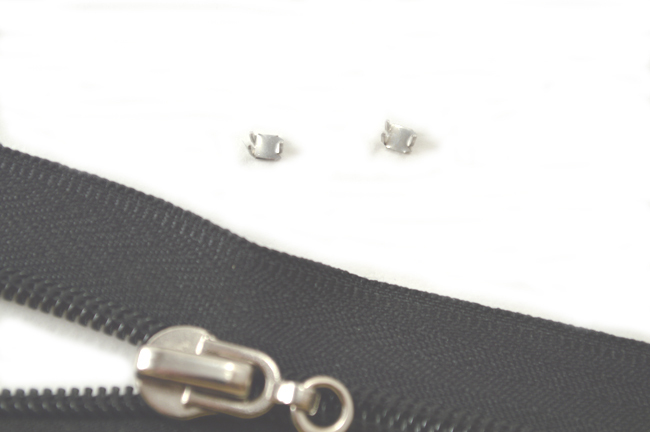 Top stops are impossibly tiny little clamps that attach to either side of the zipper tape to keep the pull from sliding off. 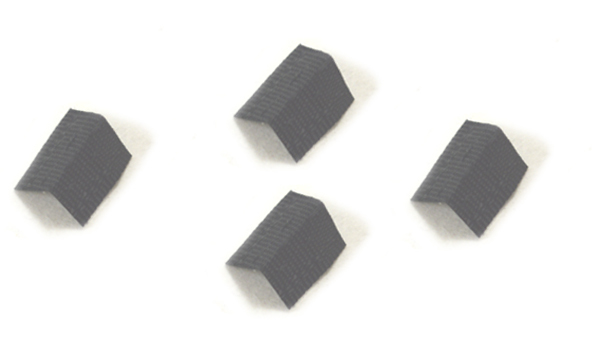 Top stops have two prongs on one side and one on the other side. 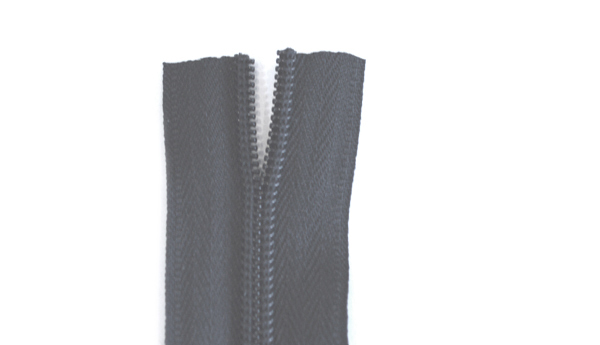 Take the side with one prong and push it between two of the zipper teeth (it’ll fit perfectly between the teeth). 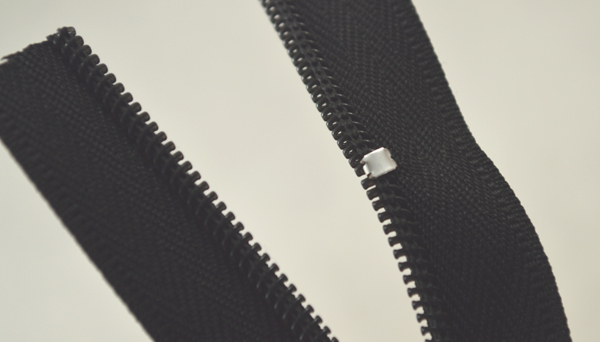 Then push the side with two prongs through the zipper tape. 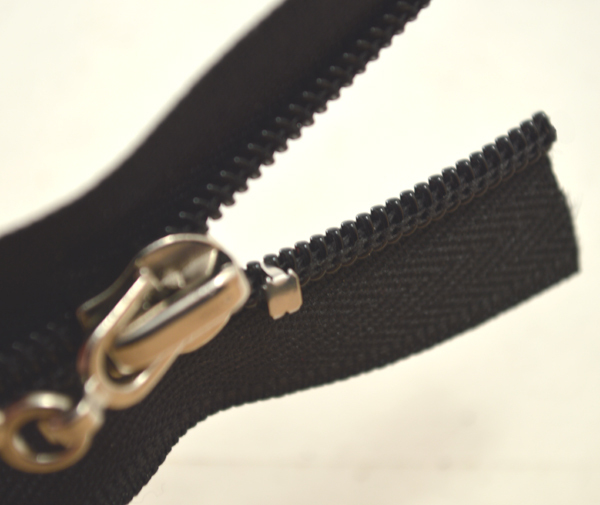 Now your zipper’s about 95% finished. In fact, if you want, you can stop right here. 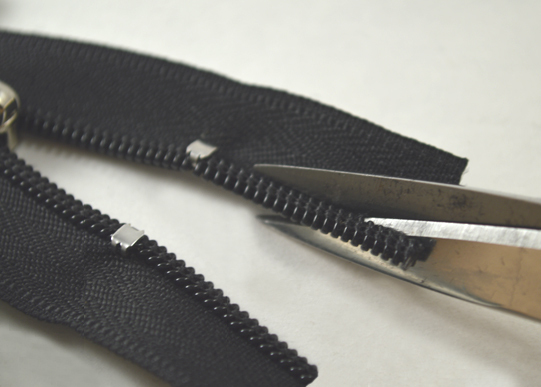 But I will show you how to put the finishing touch on your zipper. 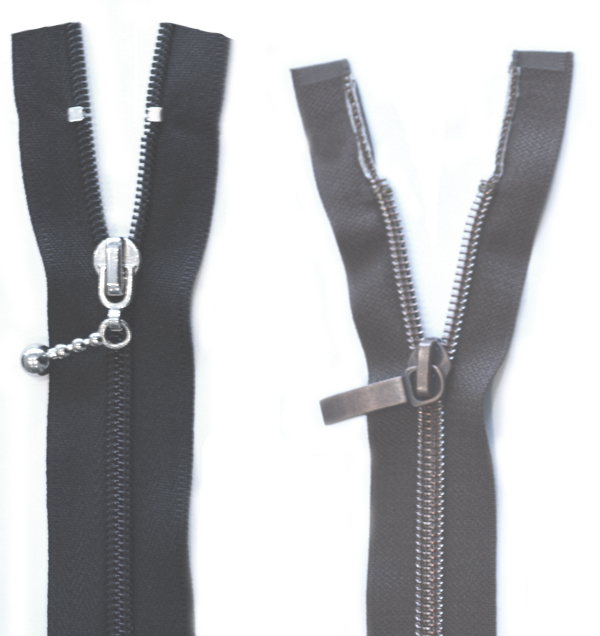 On the left is my zipper up to this point, and on the right is a zipper that I purchased in a store. Very nice! 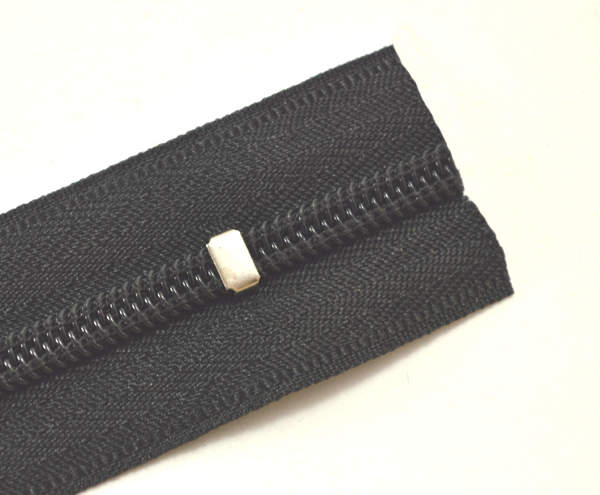 I like this homemade zipper better than the store-bought one, and it was much less expensive. 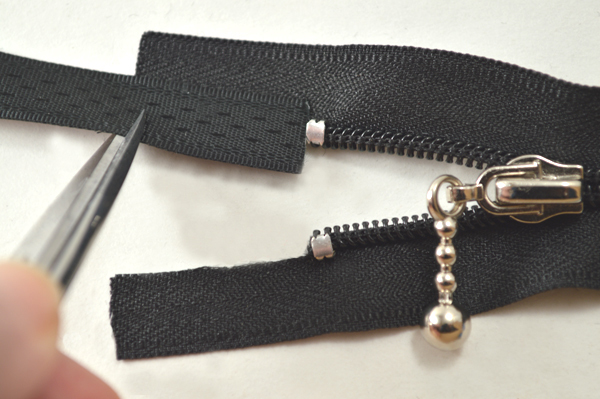 With practice, you can put together a zipper like this in no time.